This review summarizes two very interesting papers published more or less recently by the Overman group (he is still my favourite… ). I decided to combine both papers because a common intermediate was used to make all four natural products and its synthesis makes use of some uncommon in situ Umpolung chemistry. 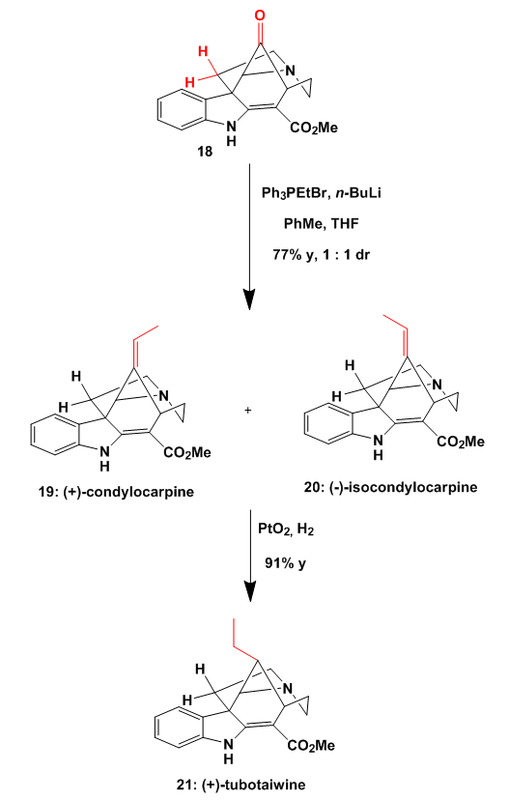 The first schemes were reproduced from the JACS paper while the last two schemes came from the OL paper. Starting with Boc-protected GABA 1 the free acid was transformed into the Weinreb amide and alkylated with a vinyl-Grignard to get 2. 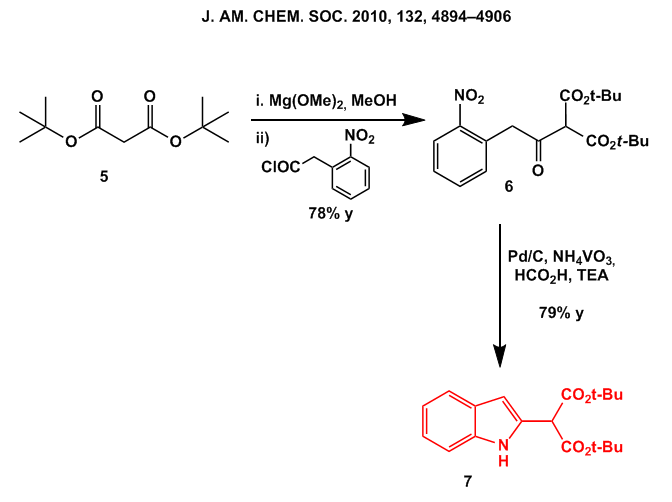 Enantioselective reduction of the resulting ketone with high ee was accomplished by using catalyst A in the presence of hydrogen (Noyori’s catalyst). Ozonolysis of the double bond and trapping of the alcohol and resulting aminal with acetic anhydride furnished piperidine 4. The second main fragment was obtained in two steps from di-tert-butylmalonate. Deprotonation and acylation gave compound 6 which formed indole 7 after reduction of the nitro group with Pd on charcoal in the presence of vanadate. Then it is getting more interesting: the blue and red fragment were combined by using a bit of scandium triflate to form 8 with great diastereoselectivity. Reductive removal of the acetyl protecting group and Swern oxidation of the resulting free alcohol produced ketone 9. 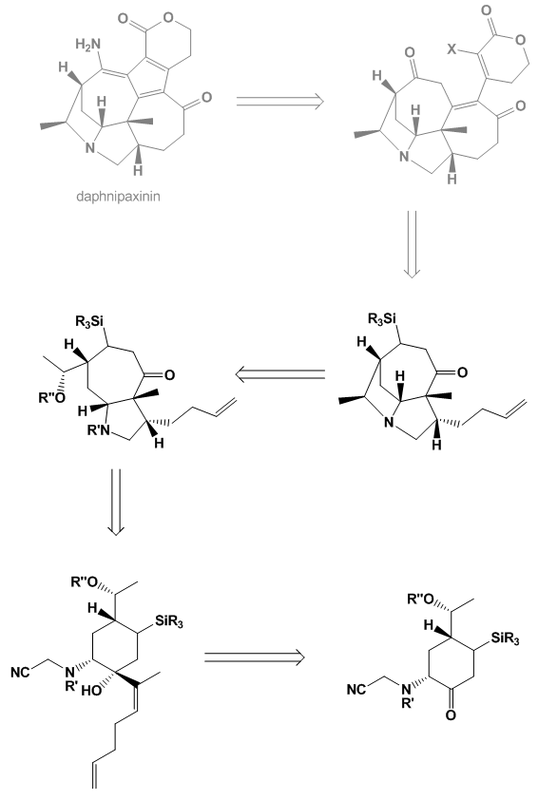 Next my favourite reaction of the whole paper was employed: first a double deprotonation of the ketone and the malonate and then combination of the two carbanions to form the critical bicyclic ring system. Although the yield is moderate it proceeds with high dr. [Fe(DMF)3Cl2][FeCl4] was prepared from dehydrated iron(III)chloride and DMF by simply mixing the reagents. Finally addition of vinyl-Grignard under Luche conditions to the ketone forms lactone 11. Going on with the synthesis the lactone and the remaining ester group were reduced to get bis-alcohol 12. 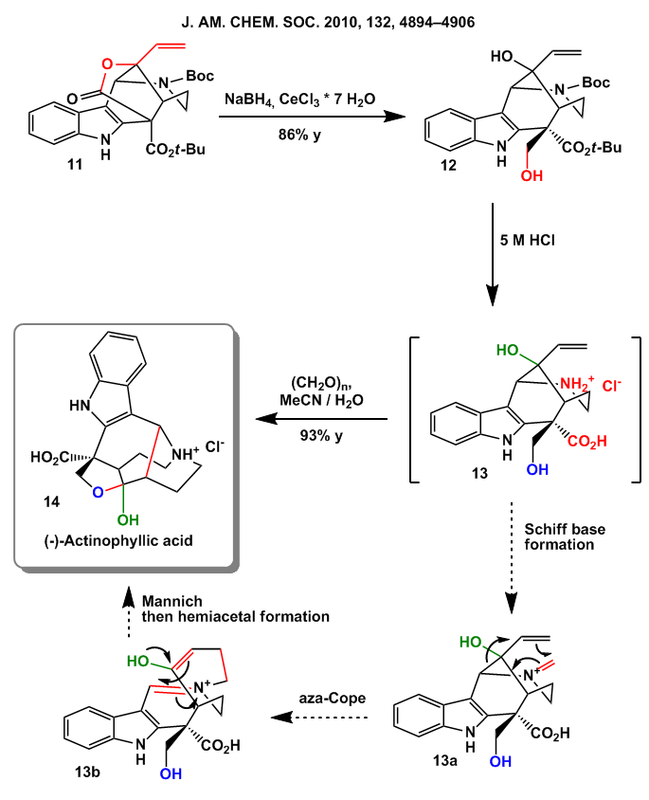 At this stage Overman makes use of his almighty aza-Cope/Mannich reaction. First a Schiff base formed from formaldehyde and the secondary amine. This underwent an aza-Cope rearrangement (or some sort of Prins-reaction) with the allyl alcohol to form 13b. The newly formed enol then attacks the rearranged Schiff base in a Mannich reaction to give (-)-Actinophyllic acid 14 as its hydrochloride. Finally to the paper mentioned first. 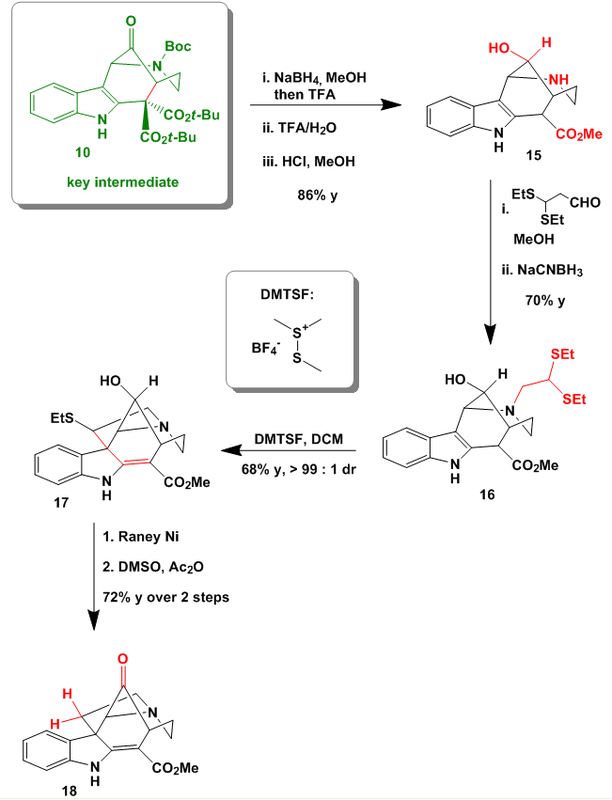 Starting from key intermediate 10 the ketone was reduced, the Boc group removed and the malonate decarboxylated/transesterified to give amine 15. Reductive amination with the dithioacetal aldehyde shown was followed by a DMTSF mediated alkylation to give 17. Reductive desulfuration with Raney Ni and oxidation of the remaining alcohol under Albright/Goldman conditions (Swern-oxidation) furnished 18. Wittig reaction of the keto group then produced (+)-condylocarpine (and (-)-isocondylocarpine respectively) which was reduced in the presence of platinum oxide to give (+)-tubotaiwine. Nice… I had the schemes finished a few days ago but also had to write my last serious exam so … What do you think? Any comments? 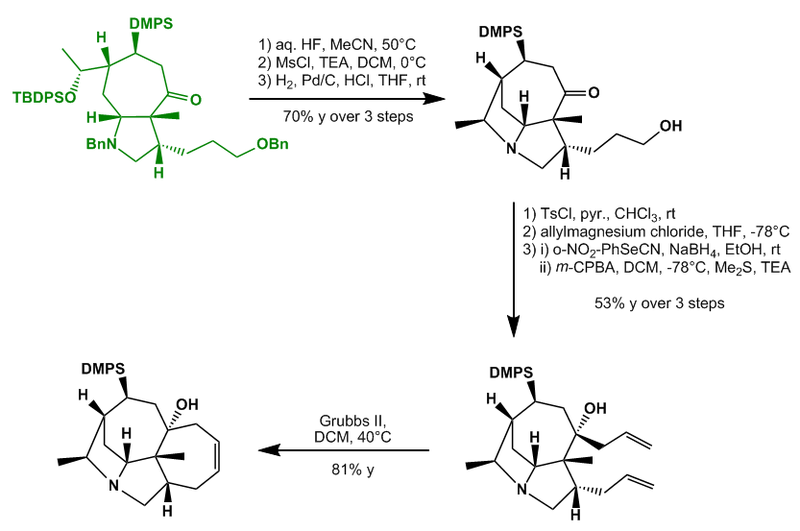 It’s finished… took me some weeks to complete this review but here it is: a sweet “towards”-total synthesis from the Overman group. The compounds to be made are Daphnicyclidin A – D whose biological profile is poorly studied yet. The crude extracts of the plant are used in Chinese folk medicine… so some biological effect could be expected. The paper skips the last 2 stages which I painted in grey so a full account could be expected in the near future. I think the retro does not need some comment, questions should being answered in the following schemes… so let’ get started. 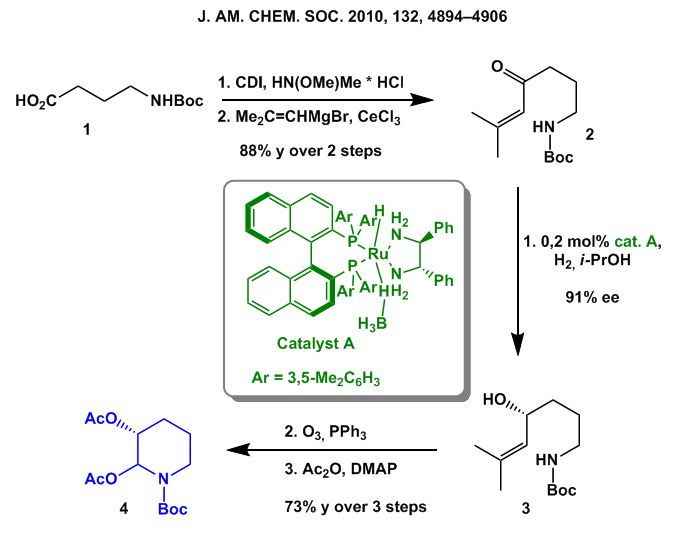 First a nice DA reaction developed by the MacMillan group formed the cyclohexene carbaldehyde was followed by a stereoselective methylation under conditions described by Woodward. 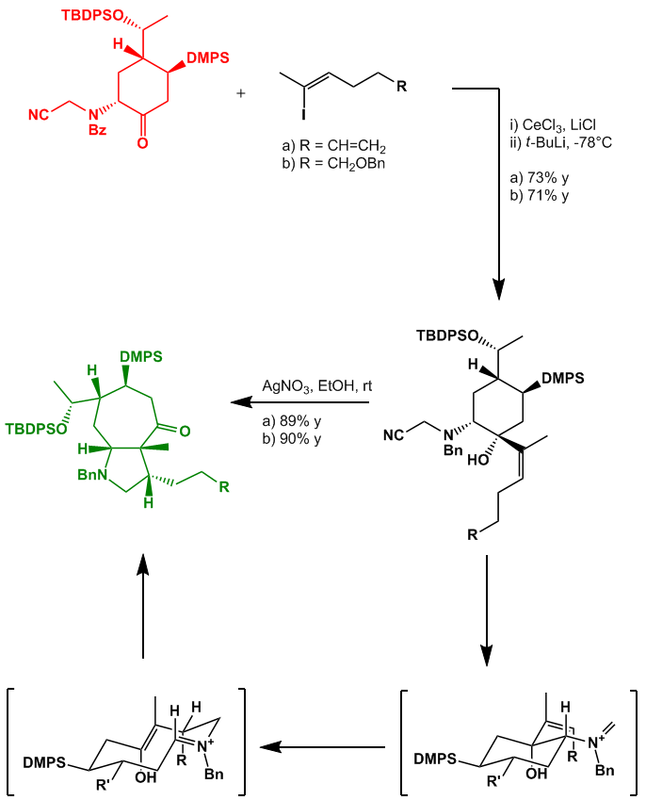 TBDPS protection, Saegusa-like oxidation and TBS enol ether formation completes the first part in overall great yield and e.r..
Hydroxybenzamide was oxidised with periodate to give in situ nitrosocarbonylbenzene which undergoes a hetero-DA in acceptable yield and diastereoselectivity. The crude mixture was used in the next step, a Mo(CO)6 induced cleavage of the N-O bond and deprotection. to yield the cyclohexenone shown. 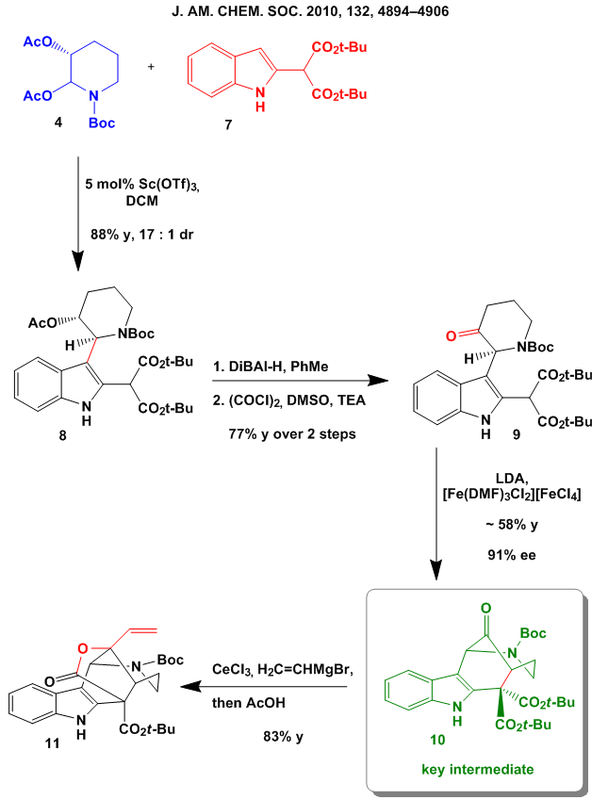 Conjugate addition of DMPS-lithium and epimerization of the benzoylamide was followed by de-benzoylation/reduction, alkylation and Swern oxidation to give the red fragment ready for the crucial aza-Cope/Mannich-reaction sequence developed by Overman some years ago. After some efforts to tune the reaction conditions for the introduction of the side chain, a premixed solution of the ketone with CeCl3 and LiCl was treated with the iodie and t-BuLi giving the alcohol in good yield. Some silver nitrate then induced the key transformation, the aza-Cope-Mannich reaction, forming 2 of the 6 rings required. 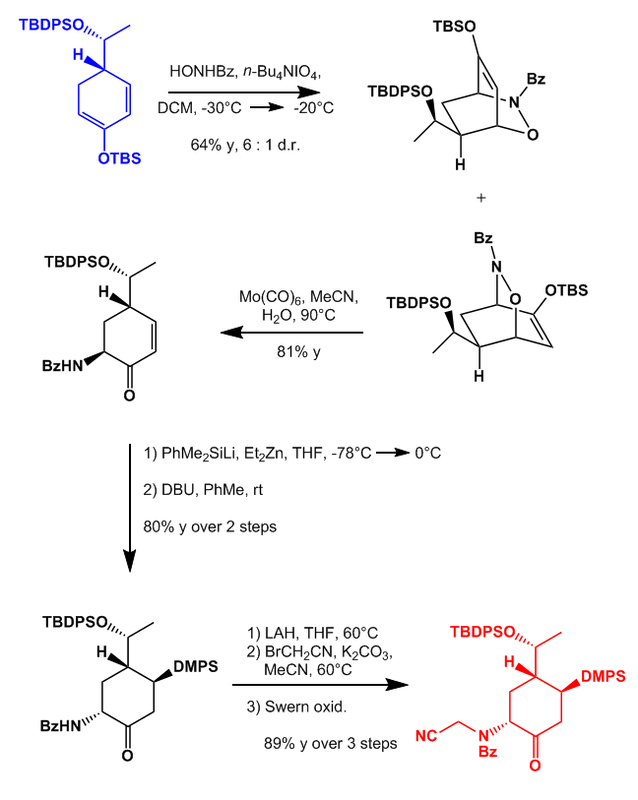 The first approach starts with TBDPS deprotection, mesylation of the delivered alcohol, which directly undergoes SN2 displacement, and double debenzylation. The free alcohol was tosylated, followed by Grignard addition of allylmagnesium chloride on the ketone. 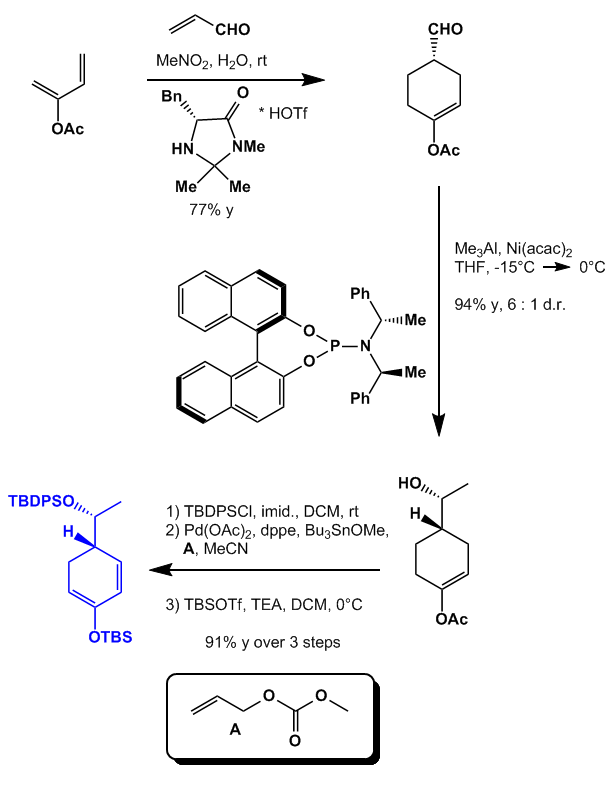 Treatment of the tosylate ester with the p-nitrophenyl selenide anion and subsequent oxidation with mCPBA yielded the required terminal bis-olefin. Grubbs II then did the job and closed the fourth ring ready for further transformations. A Grignard addition under Lewis acid conditions starts this sequence off. Grubbs II closed again the seven membered ring in excellent yield. Alcohol transposition with thionyl chloride and DMP oxidation (if I remember right CrO3 should do the same job in one step?) gave the α-β-unsatured ketone. 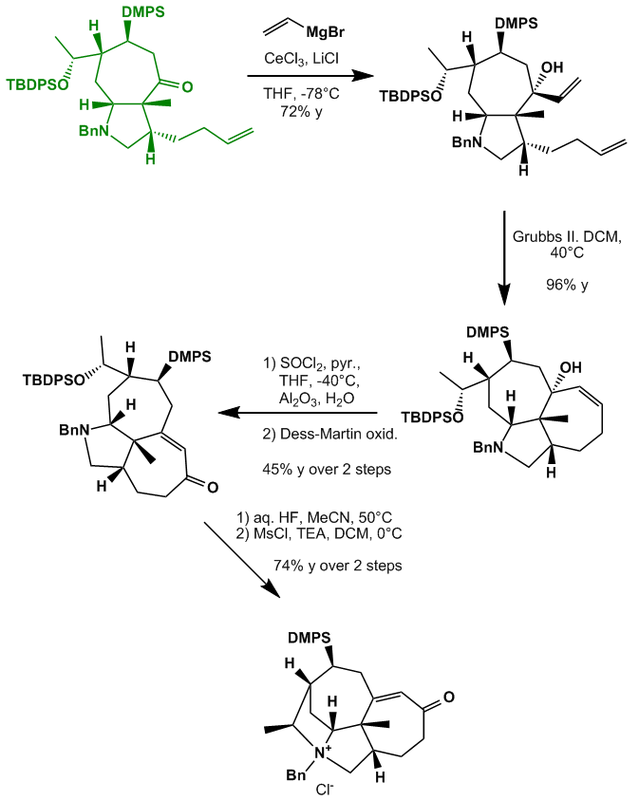 TBDPS deprotection and mesylation/in situ ring closing yielded a structure similar to the one in the scheme before. Yeah, I really appreciate the work from Overman’s groups. He’s really one of the best chemists alive. What do you think?